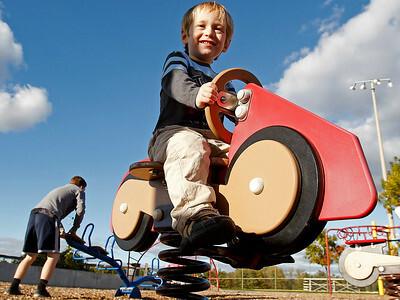 Matthew Apgar - mapgar@shawmedia.com Nathan Krejci, 3, rides a motorcycle on a spring as his brother, Andrew Henne, 16, back, pushes his sister, Kiley Krejci, 6, all of Cary, on the seesaw on Friday, Oct. 09, 2015 at Lions Park in Cary. 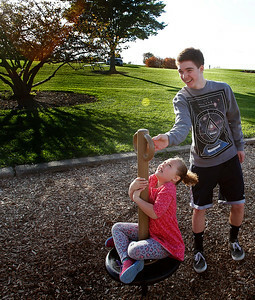 Matthew Apgar - mapgar@shawmedia.com Andrew Henne, 16, laughs as he spins his sister, Kiley Krejci, 6, both of Cary, on a dizzying ride on Friday, Oct. 09, 2015 at Lions Park in Cary. Nathan Krejci, 3, rides a motorcycle on a spring as his brother, Andrew Henne, 16, back, pushes his sister, Kiley Krejci, 6, all of Cary, on the seesaw on Friday, Oct. 09, 2015 at Lions Park in Cary.